San Antonio and New York. President Donald J. Trump commented on the sweeps via Twitter, naturally, like this: “The crackdown on illegal criminals is merely the keeping of my campaign promise. Gang members, drug dealers & others are being removed” (emphasis added). Apprehension and deportation proceedings against active gang members and drug dealers are neither new nor controversial enforcement priorities. But businesses with workforces composed of significant immigrant or migrant populations are now faced with a troubling question: Since President Trump’s immigration order allows agents to arrest anyone seen to pose a risk to either public safety or national security, “in the judgment of an immigration officer,” how aggressively will enforcement teams pursue the “& others”? As of today’s date (February 17, 2017), there are reports of ICE agents making unannounced visits to agricultural employers in the Columbia Basin, Pasco, and the Lower Yakima Valley. At this point it is unclear whether any of these visits will escalate to the point where agricultural workers are rounded up and subjected to deportation proceedings. There are a reported 11 million undocumented immigrants in this country, and it is estimated that more than 8 million of them are actively employed in the American workforce. About two-thirds of undocumented workers have lived in the United States for at least a decade. The Pew Research Center estimates that Washington State is home to approximately 250,000 undocumented residents, the majority of whom are employed in agriculture or construction. It is estimated that as many as 78% of the seasonal farm laborers in the United States (National Agricultural Workers Survey, Farmworker Justice) have obtained employment by presenting falsified work authorization documents. If those numbers are accurate, then there may be as many as 117,000 undocumented immigrants working to bring Washington’s $10 billion worth of agricultural commodities to market this year alone. The Obama administration immigration enforcement scheme was termed “Operation Cross-Check”. It prioritized apprehension of what it termed “fugitives” - immigrants who were convicted of significant criminal behavior, those who were deemed to pose a public safety or national security threat, and those who had entered the country after January 1, 2014. According to ICE, 99.3% of deportations in 2016 “clearly” met those priorities. The Trump administration has publicly adopted the same prioritization (e.g., going after “criminals”), but through an executive order that has drastically expanded the target zone. Now, in addition to deporting undocumented immigrants who have been charged with a crime, agents are under express orders to prioritize removal of immigrants who have “engaged in willful misrepresentation in connection with any official matter or application before a governmental agency”. 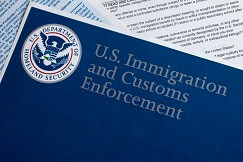 This expanded enforcement priority arguably includes laborers who may have obtained a false social security number or green (permanent resident alien) card, and even those who willingly pay income taxes using any incorrect personal identifiers. Employers could be caught in the middle. Employers are required by law to review work authorization documents at the time of hire and to certify that those documents appear valid on their face. Employers cannot, however, specify which documents they will accept from an employee, and it is unlawful to treat any applicants for work differently because of their national origin or citizenship status. So where does that leave agricultural employers in the event of an ICE enforcement action? 1. Identify an individual in your organization to be Primary Contact (PC) between the company and ICE. Circulate your PC’s emergency contact information to your orchard and facility managers and instruct them to contact your PC immediately upon contact with ICE. Consider having a backup PC in the event your primary PC is not accessible. 2. Expressly instruct your orchard and facility managers as well as any staff that interact with the public that they may not provide consent to ICE agents to enter your facilities. They should instead document their contact with the agents and refer the agent immediately to the PC. 3. The PC should immediately identify and make contact with the lead ICE agent. Directly ask whether your company is the subject of an audit, or an investigation, neither of which generally requires a search warrant, and each of which allows the employer a reasonable period of time to consult with counsel and to negotiate a mutually convenient time in which to provide access to your facilities and records. 4. If you are advised that there is no search warrant, respectfully advise the agents that they must wait until you’ve had time to consult with your attorney. Ask them to provide the telephone contact information for the person with whom your attorney can arrange a mutually agreeable and convenient time. 5. NOTE: It is possible that you’ll be presented with a subpoena. A subpoena is not a search warrant. A subpoena presents a heightened level of urgency, but we recommend you still follow step four (4), above. 6. If the agents do have a search warrant, then you are likely in the midst of an immigration enforcement raid. Take a deep breath. a. That it is signed by a judge. b. That it identifies the agency conducting the operation. c. That it has correctly identified the precise location or locations to be searched. d. That it includes the correct date upon which the warrant may be executed. e. That it has not expired. 8. If you determine that any information is missing, please raise the issue with the lead agent and ask for an explanation. If any of the information is missing, we recommend that you articulate that you do not consent and are not providing permission to access your facilities. We do not recommend, however, that you deny or resist access. Allow the raid to continue, just make sure you do not provide actual or constructive permission, and make sure you document both your objection and the agent’s response. 9. During the raid, you and your management team are entitled to accompany the ICE agents on their search. Please know it is probable that a raid of any considerable scope will involve multiple agents. Consider establishing a Raid Observation Team composed of experienced and detail-oriented management-level employees. Your HR and QC Departments are good places to look for participants. Provide them with safety vests or other labeled clothing that makes them visible in the workplace and clearly identifies them as members of your team. Instruct them to follow the agents, to observe, and report - but to not in any manner interfere. Have plenty of notebooks and pens available, and instruct your team to take meticulous notes of what is being said as well as what (or whom) is being removed from the workplace. 10. If the agents attempt to remove electronic information or paper documents DEMAND that you be entitled to make copies before the information or documents are removed from your business. Document the agents’ response. One reason that both the Bush and Obama administrations reduced their reliance on workplace raids was because of the impact on families. Some studies have found that for every two immigrants apprehended there is at least one child left behind - and the child, most often, is a U.S. Citizen. The raids themselves often times seemed designed to incite a level of panic and distress in the workplace, and apprehension of individuals are sometimes reported to involve physical restraint. It is important to know that your employees have important legal rights. They have the right to remain silent and the right to speak to an attorney. Importantly, they have the right to respectfully refuse to show or sign any documents until they’ve had the opportunity to seek legal counsel. There are reported instances where apprehended subjects are asked to sign documents that allow for immediate deportation, without any hearing or other form of due process. The Northwest Immigrant Rights Project has collaborated with attorneys and other volunteers from around the State to create a Rapid Response Network (RRN). The RRN is designed to react immediately to large-scale raids and to provide basic immigration advice to as many immigrants as possible. In some instances the RRN may be able to help workers preserve their legal rights, to navigate the bond process, and to help the workers make arrangements to care for any children who may be impacted by the raid. The Northwest Immigrant Rights Project has also accumulated a helpful array of resources for workers, including a checklist to prepare for possible immigration raids. In the event your company is subjected to a raid, please consider reaching out immediately to the RRN for the purposes of providing basic legal advice and humanitarian support for your workforce.